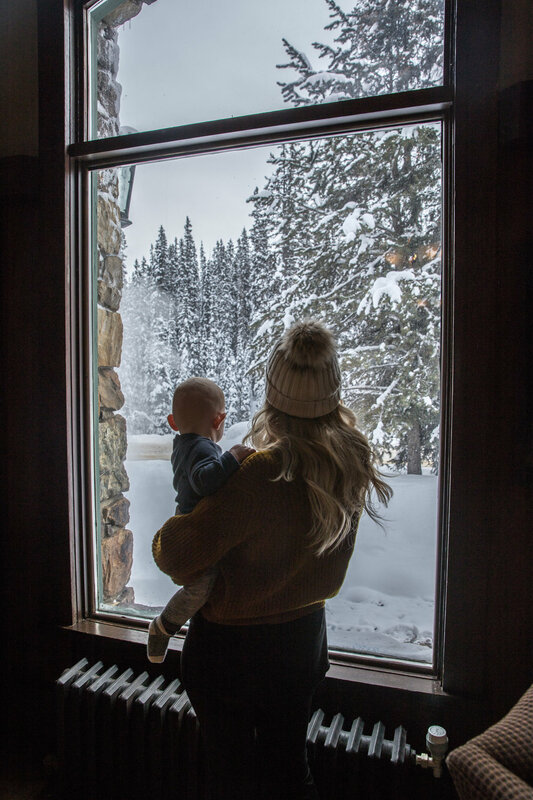 Deer Lodge hosted our family for a wintry getaway this past January and it was a snowcation at its finest. Situated in the heart of the Rocky Mountains, within walking distance to Lake Louise, the lodge offers historic charm and cozy comfort. If you are looking to hit the slopes, the lodge is one of the handful of accommodations in the area that is in close proximity to the Lake Louise ski hill. Or you may want to try cross country skiing or snowshoeing on one of the many nearby trails. You can also take a walk through the winter wonderland over to Lake Louise where you can skate on the frozen lake. The Banff Ice Magic Festival was on during our stay so we enjoyed walking around the beautiful sculptures to admire the artistry. Whatever your preferred outdoor adventure may be, a soak in the rooftop hot tub post adventure provides the perfect end to your day. My single most favourite experience of our stay at Deer Lodge was enjoying a relaxed breakfast in the Mount Fairview dining room. Food at any of the CRMR resorts is always amazing and the breakfast at Deerlodge did not disappoint. Sydney ordered the Brioche French toast served with caramelized pear, spiced walnuts and Chantilly cream and it was incredible!! Just writing about it is making me want to head back for more! Dinner in the Caribou lounge was another favourite! The setting of this original log teahouse built in 1923 is beautiful and quaint. And with incredible views from any of the seats in both the Mount Fairview dining room and Caribou lounge, we were never in a rush to leave. We savoured both the food and the atmosphere with each dining experience. If you are in the mood to stay warm and cozy, the Lady Agnus Room offers complimentary coffee from 7:00am – 11:00am on weekdays, with several areas nearby to cozy into a chair with a book or newspaper. Whether you are travelling internationally or enjoying your own Canadian backyard, Deer Lodge is a great option for a stay in the beautiful Rocky Mountains.